Motor Vehicles Act, 1988, S.166–Accident–Insurance–Deceased being the brother of the owner—In present case there is Comprehensive/Package policy- -Therefore, Insurance Company cannot contend that deceased being the brother of the owner would step into the shoes of the owner and it would be a case of the same person being both the claimant and recipient-Insurance Company held liable to pay. Comments Off on Motor Vehicles Act, 1988, S.166–Accident–Insurance–Deceased being the brother of the owner—In present case there is Comprehensive/Package policy- -Therefore, Insurance Company cannot contend that deceased being the brother of the owner would step into the shoes of the owner and it would be a case of the same person being both the claimant and recipient-Insurance Company held liable to pay. Accident—Insurance—Theft of Vehicle—Insurance Company is still liable to pay to a third party, regarding accident by stolen vehicle. Comments Off on Accident—Insurance—Theft of Vehicle—Insurance Company is still liable to pay to a third party, regarding accident by stolen vehicle. Accident—Route permit is required for plying a bus belonging to an educational institution. Comments Off on Accident—Route permit is required for plying a bus belonging to an educational institution. Held; If there were two vehicles on road and it was admitted that there was a collision then the person who caused the collision must take the responsibility—In present case both the drivers held to be equally responsible. Comments Off on Held; If there were two vehicles on road and it was admitted that there was a collision then the person who caused the collision must take the responsibility—In present case both the drivers held to be equally responsible. Advocates Fee—With regard to matters referred by Court to counsels of Insurance Companies present in court—Certain directions issued. Comments Off on Advocates Fee—With regard to matters referred by Court to counsels of Insurance Companies present in court—Certain directions issued. 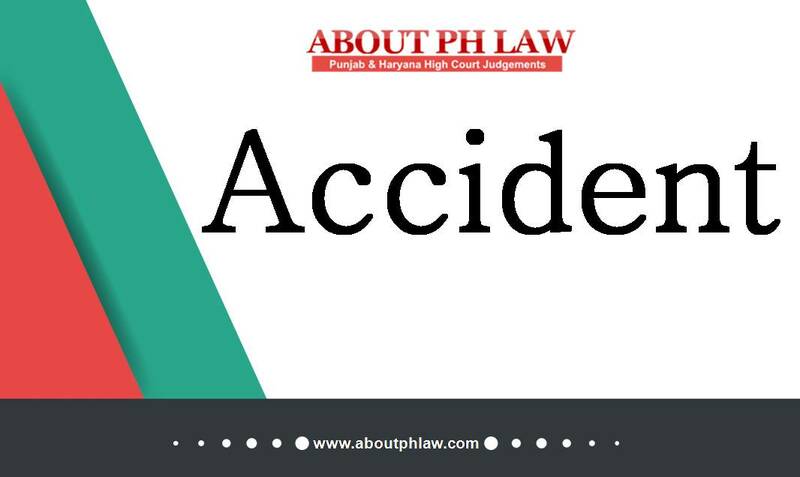 Motor Vehicles Act, 1988, S.166–Accident–Route Permit-Merely because truck was plying in State for which it does not have route permit would not absolve Insurance Company of its liability to pay. Comments Off on Motor Vehicles Act, 1988, S.166–Accident–Route Permit-Merely because truck was plying in State for which it does not have route permit would not absolve Insurance Company of its liability to pay. Motor Vehicles Act, 1988, S.166–Accident~ Right to Recover-Tribunal specifically observed that driver was holding a valid during licence, Registration Certificate and route permit were valid-in such circumstance Insurance Company cannot be given right to recover when there was not liability on owner and driver. Comments Off on Motor Vehicles Act, 1988, S.166–Accident~ Right to Recover-Tribunal specifically observed that driver was holding a valid during licence, Registration Certificate and route permit were valid-in such circumstance Insurance Company cannot be given right to recover when there was not liability on owner and driver. Accident—Pay & Recover—Even if insurance Company has no liability to pay but insurer of offending vehicle must be directed to firstly pay to claimants and then recover from owner. Comments Off on Accident—Pay & Recover—Even if insurance Company has no liability to pay but insurer of offending vehicle must be directed to firstly pay to claimants and then recover from owner. Motor Vehicles Act, 1983–Accident–Claim Petition—The language employed in sub-section (2) makes the intention of the legislature very clear—It confers the jurisdiction upon the Claims Tribunal within the local limits of whose jurisdiction “accident occurred”, or “claimant resides” or “claimant carries on business” or “defendant resides”. Comments Off on Motor Vehicles Act, 1983–Accident–Claim Petition—The language employed in sub-section (2) makes the intention of the legislature very clear—It confers the jurisdiction upon the Claims Tribunal within the local limits of whose jurisdiction “accident occurred”, or “claimant resides” or “claimant carries on business” or “defendant resides”. Motor Vehicles Act, 1988, S.166–Accident-Proof of ownership-Liability of Insurance Company—the transfer of ownership operates by delivery of a vehicle under Section 19 of the Sales of Goods Act -Registration of vehicle is an evidence of ownership and not at all times the only source of assessing the ownership. Comments Off on Motor Vehicles Act, 1988, S.166–Accident-Proof of ownership-Liability of Insurance Company—the transfer of ownership operates by delivery of a vehicle under Section 19 of the Sales of Goods Act -Registration of vehicle is an evidence of ownership and not at all times the only source of assessing the ownership. Motor Vehicles Act, 1988, S.166–Accident–Just Compensation- If overall award of compensation is just and fair, then, such award deserves to be upheld in claimants’ favour. Comments Off on Motor Vehicles Act, 1988, S.166–Accident–Just Compensation- If overall award of compensation is just and fair, then, such award deserves to be upheld in claimants’ favour. Accident—Claim Petition—Claimant cannot resile from the initial statement to Police. Thereafter filed claim petition by putting allegation on offending vehicle-Held; it appears that he has been managed subsequently- Claim petition dismissed. Comments Off on Accident—Claim Petition—Claimant cannot resile from the initial statement to Police. Thereafter filed claim petition by putting allegation on offending vehicle-Held; it appears that he has been managed subsequently- Claim petition dismissed.